I’ve wanted to make a trip back for many years and could just never work it out. Recently, we realized that we had some unused airline tickets to use up so we booked a trip and made an extended weekend out of it. 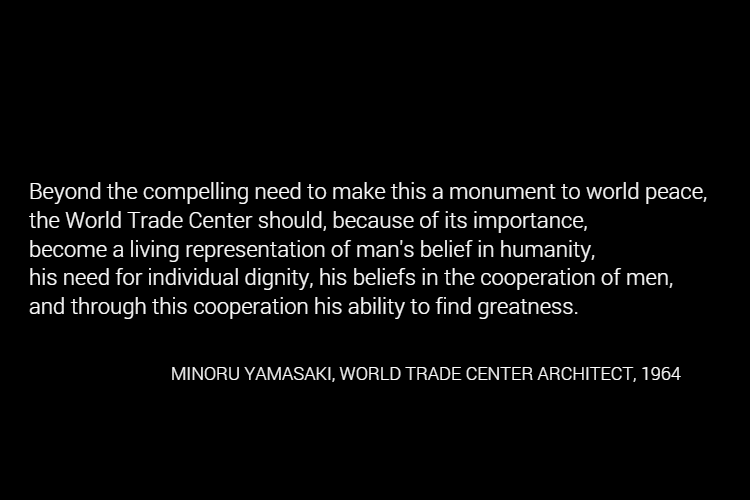 I knew that visiting the World Trade Center site and National 9/11 Memorial had to be on our agenda. I needed a few days after our visit to be able to put my thoughts together and share them because, frankly, the experience was far more overwhelming than I had anticipated. The Memorial and Museum has not been without controversy. Some families are upset that unidentified remains are buried behind a wall within the main hall and that they are in essence sharing their loved ones final resting places with visitors. Others are upset at the inclusion of acknowledgement and stories about the hijackers. There is also a quote on the wall in the main Memorial Hall that has generated a bit of controversy. As a visitor paying my respects, I had no issue with either of these and I’m glad they are both a part of the experience. We first visited the site at night. You can see the new WTC 1 (a.k.a. The Freedom Tower) from all over Manhattan. There is still a lot of construction around the area and you end up just walking up on a park that contains the two memorial pools. These pools are in the footprint of the original Tower 1 and Tower 2. It was quiet there that night, only a few others moving quietly around. For some reason, the water wasn’t flowing in the North Tower pool. It was interesting to feel the difference between the two: one silent and calm, the other the water flowing over the sides in thousands of individual streams. In both cases, the names of those killed that day ring the perimeter. Our main visit was set for two days later, early on a Monday morning. We arrived at the site again and this time it was a bit busier, but still quiet and peaceful. If you’ve ever visited NYC you know that there is just an omnipresent sound, a drone, a hum of activity. Even though we were in the middle of the financial district, that hum was not present. The falling water was all you could hear. The entrance to the museum is tucked between the two memorial pools and we made our way in. The museum occupies space that encompasses the footprints of both buildings, but all below ground. As soon as you enter, you take an escalator down into the main entry, past two large columns of steel. In conflict with the memorial plaza which is clean and simple, this is the first glimpse you see of the destruction from that day. It’s striking but does not prepare you for the things you will see and experience as you move through the museum. We opted to rent a self-guided audio tour player and if you don’t take a tour with a guide I would highly recommend this. Once we had our players, we went to where they indicated we should start and pressed play. Robert DeNiro becomes your guide for the rest of the time that you are in the museum. He lives in the area and was deeply affected the collapse of the towers. His voice is calming and reassuring as he guides you through the building and introduces you to others who played pivotal roles that day as well as the artifacts presented throughout the space. The majority of the museum is hidden from plain view. When you enter the main hall, it is an enormous open space that is fairly bare and quiet. 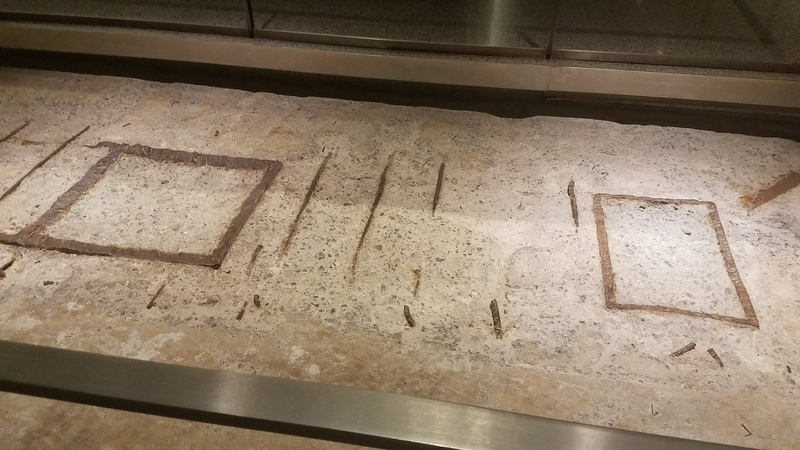 There are some larger pieces in the hall and they are important: The Last Column, some pieces that were recovered from the impact zone of the first plane, you descend to the main level next to the survivors stairs. These are powerful and start to give you a sense of what you’re in the middle of, where you are. You also walk past a spot that was the epicenter of the 1993 bombing. those boxes are called “Box Columns” and they formed the outside of each tower. They were embedded deep into the ground, many stories deep. These are what’s left of them. 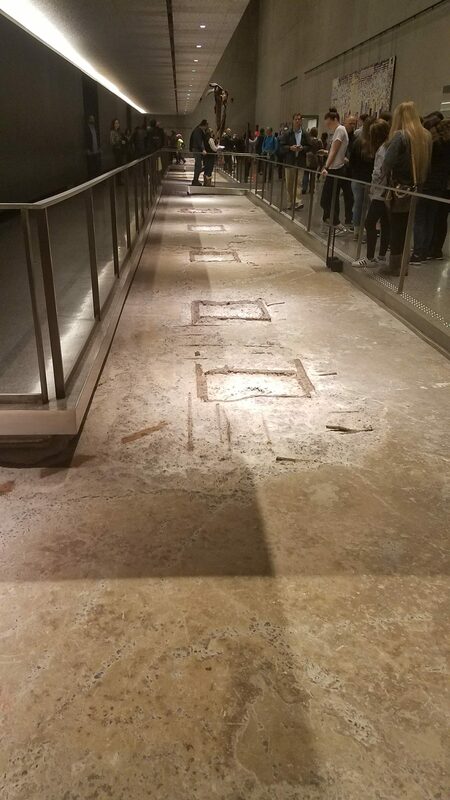 As they dug the site out, when they got here they sheared them off and left them in place to show the original footprints of each building. At each tower, you have to cross over them to get into the main exhibits. 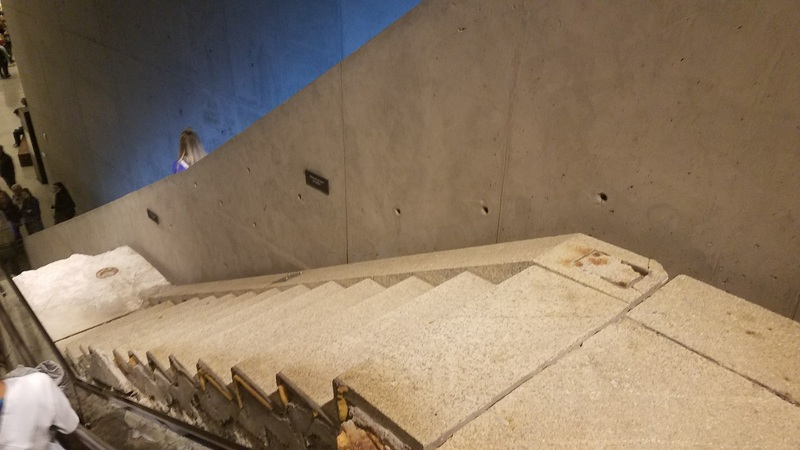 In the South Tower is some historical information about the buildings, the history of their construction and photo exhibit from the FEMA photographer who was given completely unrestricted access to the recovery operations. The other main portion of the museum that is located within the footprint of the South Tower is the In Memoriam room. In it is a picture of every person who died that day. In the center of that room is another, quieter, darker room where the names of the dead are always being read. Using recordings made by family members during anniversary ceremonies, each name is read aloud on a never-ending loop. Along with their name, some information about them is projected up on the wall. This room was completely overwhelming to me. The quiet ambiance was even more subdued in here. Many visitors would stop, sit on the benches for a few moments and just listen as the names were read. Most could be seen dabbing at their eyes or wiping away a tear. You couldn’t help but to get emotional. After this, we made our way to the North Tower. You pass back through Memorial Hall where there is a quote on the wall, the letters made of reclaimed steel from the towers. This quote has generated quite a bit of controversy and I won’t go into all the details here, but you can go read about it. This stopped me in my tracks. I read later that there is a separate facility, run by the Office of the Medical Examiner of New York City that maintains all of the unidentified remains in a state such that, as technology advances, they hope to be able to identify them. 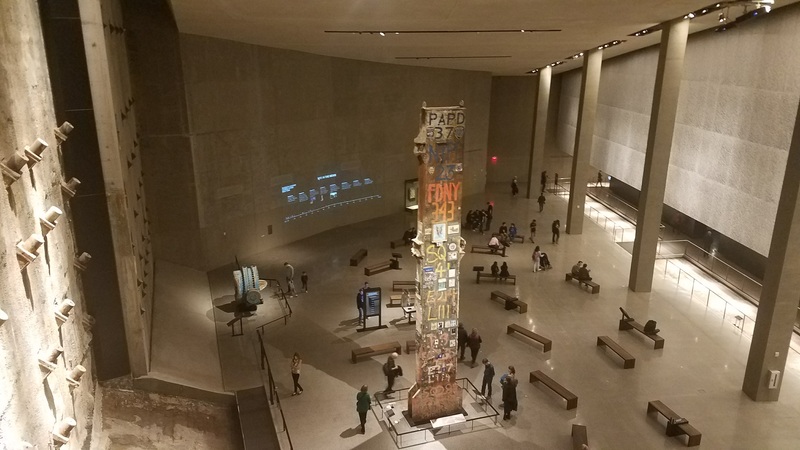 There are several large exhibits as you move towards the North Tower including a destroyed fire truck, part of the large antenna mast from the top of the South Tower, an elevator motor and some others. 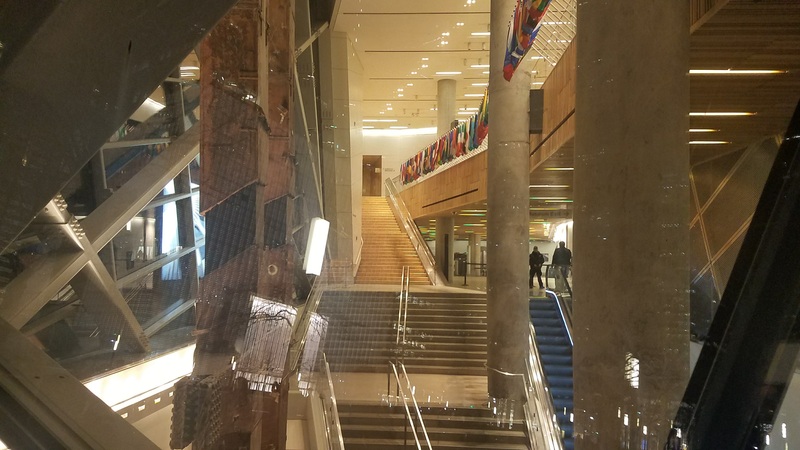 As you cross over the box beams into the footprint of the North Tower, you enter the main exhibit. There is a small sign saying that no photography is allowed. Upon entering you are greeted by a TV playing a clip of the Today show as they learned of the first impact and on another wall is a large projection of some stop motion photography that captured the first impact. It’s presented in silence and it is jarring. The scope of that first explosion was massive and seeing it erupt into the clear blue sky takes your breath away. The exhibit is presented in chronological order and contains a lot of multimedia. Television clips, air traffic control, voicemail messages from people trapped in the towers and on the planes. As mentioned earlier, the memorial and museum also includes what happened in Washington and Pennsylvania, so there are artifacts and anecdotes from those sites mixed in. At several points along the way, small alcoves have seating and you can watch a short presentation telling part of the story from people who were involved. One of those dealt with the passengers from Flight 93. I get the most emotional when thinking or talking about 9/11 when it comes to the passengers on that plane. They knew…they knew what had happened and they knew the fate that awaited them…but they rose up and turned on evil. Because of them we know that the Capitol in Washington D.C. was probably saved. I lasted less than 30 seconds in that presentation. I had to leave. These are pieces of material that look like large rocks with steel and other material poking out. 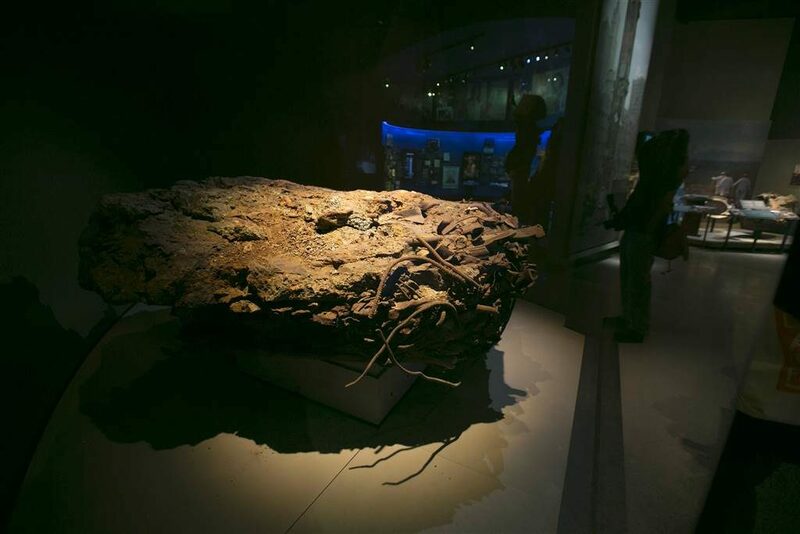 This one was 3 or 4 feet thick and about the size of your kitchen or dining room table. When the buildings collapsed, the heat and pressure compacted material into these pieces. 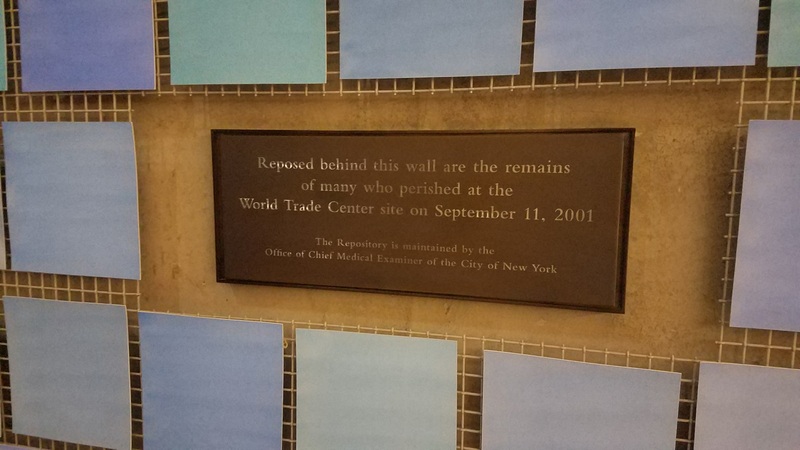 The plaque said that this particular one had been tested and represented material from at least 5 floors of one of the buildings. It’s no wonder that 41 percent of the victims have never had any remains identified. It also pointed out that they had extensively tested for any presence of remains to make sure that they weren’t putting anything like that on display. Towards the end of the exhibit is a section related to the hijackers, another point of contention for the families. It details how they entered the country and how they began their travels that day. The final section is a “what’s next” look at how the country and the world reacted in the days after. The column is filled with messages of hope and remembrance. There is also an interactive piece where you can write a message that is superimposed over the globe, which is projected at the base of the slurry wall. From there, we made our way out of the museum and out into the memorial plaza again. It was a bright, beautiful day and we lingered near the South Tower pool for a few minutes before making our way to our next destination. We spent about 2 hours making our way through but it would not have been a stretch to double that. There is so much to take in and the museum just engulfs you while it shuts out the outside world. It brought back so many feelings and memories from that day and then standing out side in the footprints of those buildings and being down in Battery Park it was not hard to imagine the total chaos of that morning, yet at the same time I can’t even imagine the horrors of being in the area that morning. 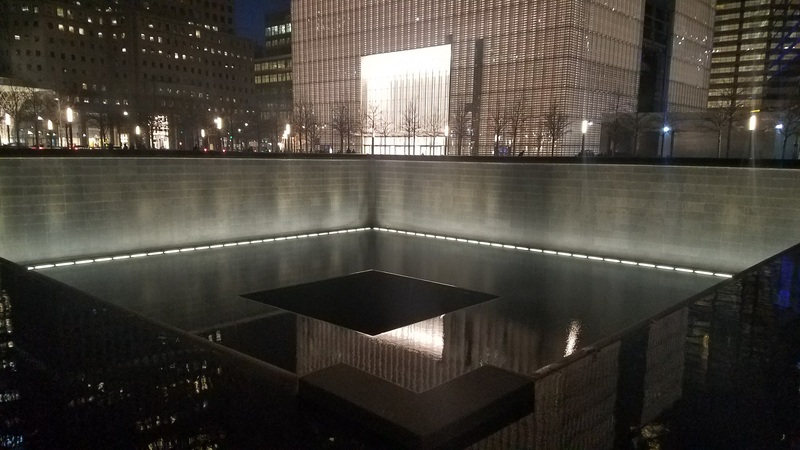 If you make your way to NYC, make sure you set aside time to visit the 9/11 Memorial and Museum. Here is a link to my full album of pictures. © 2017 – 2018, Matt.Thorne. © Matt Thorne and Thorne’s Thread, 2016-2018. Unauthorized use and/or duplication of this material without express and written permission from this site’s author and/or owner is strictly prohibited. Excerpts and links may be used, provided that full and clear credit is given to Matt Thorne and Thorne’s Thread with appropriate and specific direction to the original content.